Quick Review: In Troll Or Derby, fifteen-year-old Roller Deb is singled out by town bullies for both her skates, and for being different. When her popular homecoming queen of a sister is kidnapped by a scuzzy drug dealer, Deb must flee the trailer park in which she's grown up, and rescue her. Along the way, Deb becomes enmeshed in the magical realm of trolls and fairies, and the blood-thirsty version of roller derby at which these beings excel. But spending too much time among the fairies comes with a price. Will Deb choose to save her sister, with the aid of a mysterious troll? Or will she be lost to the lures of roller derby, and the blonde temptress April, forever? Detailed Review: I love everything about this book. The cover, the story, the characters, the setting you name it. If I was given the chance to say more about it, I would just say that it was an extraordinary read for me, something that was not mundane and doesn't occur daily. I drank everything in, from start to end and I realise something. Even though with something like roller derby mixed in together with fantasy such as trolls and fairies, everything is still amazing. Red, you are one awesome writer. 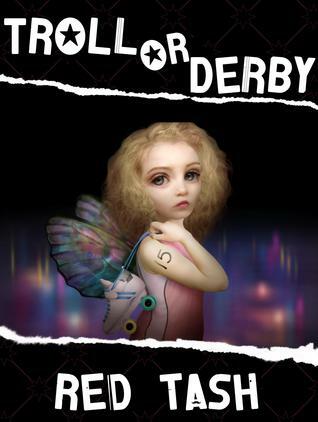 So, in Troll or Derby, it is basically about how Roller Deb loves to skate and is pulled into a world where roller derby is important and a gruesome source of entertainment. It doesn't help Deb deal with Jag McJagger, king of the trolls, who badly wants her on his team. And the fact that she is her sister Gennifer's Protector and she has to go and rescue her from Jag. So with no other choice, she joins roller derby and Jag's daughter April. or Alma Steevil (Almost Evil). Soon she finds that she starts to forget everything else but her present life. But with the help of her husband Harlow (yes she's married, to a troll against her will) she immediately shakes herself into reality and slays the evil king Jag. But if you want more, you really have got to read it yourself. I guarantee, this is a five-star read. Brief Review: OMG. Someone shoot me. I possibly have no idea what other things to say besides the fact that it's amazing. My reviewing career is ending here. Final Rating: 5/5 "Totally Amazing!" I've been looking for a good book so I will check this one out. Thanks for the review.